Introduction: Single site surgery has been described in gynecology, urology, bariatrics, and general surgery. Safety and feasibilty issues have yet to be addressed conclusively. The purpose of this paper is to describe the initial single center experience of various single site procedures at a community based center. 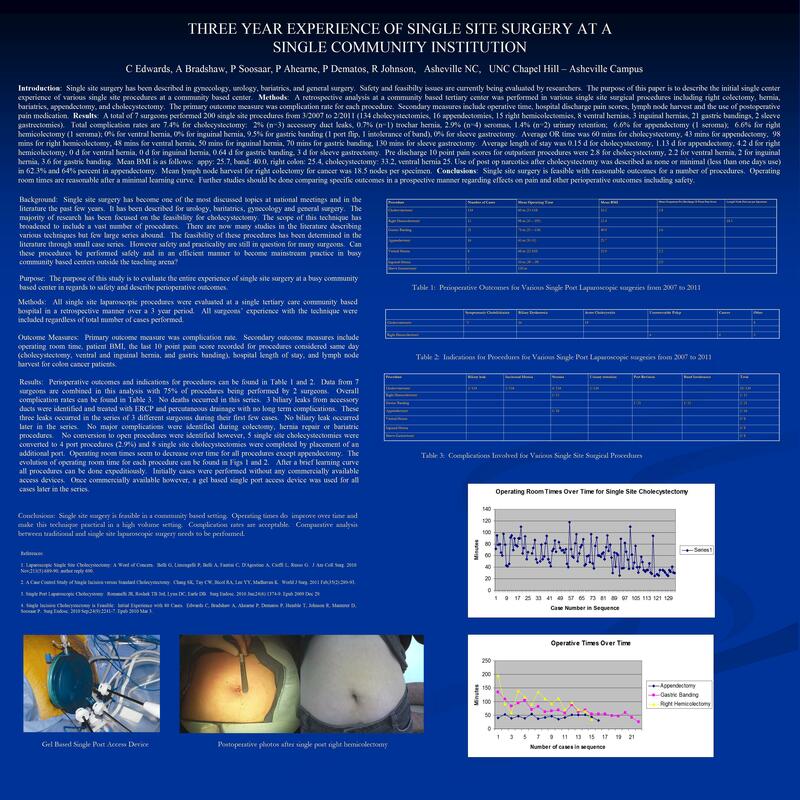 Methods: A retrospective analysis at a community based tertiary center was performed regarding all surgeons’ experience in various single site surgical procedures including right colectomy, hernia, bariatrics, appendectomy, and cholecystectomy. The primary outcome measure was complication rate for each procedure. Secondary measures include operative time, incision length, and use of postoperative pain medication. Results: A total of 7 surgeons performed 191 single site procedures were performed from 3/2007 to 8/2010 (125 cholecystectomies, 15 appendectomies, 15 right hemicolectomies, 8 ventral hernias, 3 inguinal hernias, 20 gastric bandings, 2 sleeve gastrectomies). Average OR time was 64 mins for cholecystectomy, 46 mins for appendectomy, 99 mins for right hemicolectomy, 37 mins for ventral hernia, 50 mins for inguinal hernia, 75 mins for gastric banding, 130 mins for sleeve gastrectomy. Overall complication rates are 4.8% for cholecystectomy (3 accessory duct leaks, 1 trochar hernia, 2 wound infections), 6.6% for appendectomy (1 wound infection), 6.6% for right hemicolectomy (1 wound infection), 0% for ventral hernia, 0% for inguinal hernia, 10% for gastric banding (1 port flip, 1 intolerance of band), 0% for sleeve gastrectomy. Average length of stay was 0.17d for cholecystectomy, 1.13d for appendectomy, 4.46d for right hemicolectomy, 0d for ventral hernia, 0d for inguinal hernia, 0.78d for gastric banding, 3d for sleeve gastrectomy. Pre discharge 10 point pain scores were 2.5 for cholecystectomy, 3.13 for appendectomy, 0.67 for right hemicolectomy, 2.17 for ventral hernia, 2 for inguinal hernia, 3.69 for gastric banding, 2.5 for sleeve gastrectomy. Average follow up for all cases was 4.82 months. Use of post op narcotics after cholecystectomy were described as none or minimal (less than one days use) in 62.3% and 64% percent in appendectomy. Conclusions: Single site surgery is feasible with reasonable outcomes for a number of procedures. Further studies should be done comparing specific outcomes in a prospective manner regarding effects on pain and other perioperative outcomes including safety.